Covering 102 miles from Milford Common on the northern tip of Cannock Chase to Bourton-on-the-Water in the Cotswolds, the Heart of England Way is a journey through the history, buildings and landscapes of the Midland countryside, writes the Heart of England Way Association’s secretary, Mike Norman. The route passes through the counties of Staffordshire, Warwickshire, Gloucestershire and Solihull MBC, and also links to other long-distance paths: the Staffordshire Way, Centenary Way, Cotswold Way, Oxfordshire Way, Thames Path and Millennium Way. From the Chase, the Heart of England Way curves south-east via Lichfield to the Tame Valley, then south-west through Meriden and Henley in Arden to Alcester, circling the eastern side of Birmingham but passing west of Coventry. The lower section runs south more or less across the Vale of Evesham and the northern Cotswold Hills to Bourton-on-the-Water. The Way sprang from an idea by Alcester Civic Society which, in responding to a questionnaire from Warwickshire County Council about the use of footpaths, proposed that some paths across the county be treated as key routes. There was no official response, so in 1978 the society decided to promote their own route. 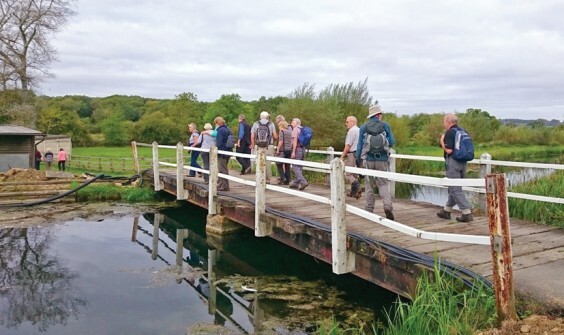 A committee comprising members from walking groups across the region was formed and they agreed to promote a route from Lichfield to Chipping Campden. Quite soon they agreed to extend the route and link the Cotswold Way with the Staffordshire Way on Cannock Chase. It should be noted the whole route followed public rights of way or roads. At first the route was called the West Warwickshire Way but it soon became the Heart of England Way. By 1979 all paths had been surveyed by participating clubs and a regional footpath agreed, at least on paper. It was put to the relevant councils – Staffordshire, Warwickshire, West Midlands and Gloucestershire – but only the latter showed any interest. Although the route followed only acknowledged rights of way there were obstructions, missing bridges and very few waymarks. In 1979 the committee wrote a guide which was published by Thornhill Press. For several years they persisted in trying to get the route recognised but without success. Once again the committee took the initiative and in 1982 began talking to farmers and landowners. Progress was made in building stiles and some obstruction were cleared and waymarks placed. Parish councils were approached and most supported the idea. Finally, in the late 1980s, the Countryside Commission took an influential interest and Warwickshire County Council began to respond, building bridges and supplying materials for stiles. A group of dedicated and enthusiastic amateurs had persisted in realising their dream, and the Heart of England Way was officially recognised as a Regional Long Distance Path. It was also incorporated as part of European path E2, which runs from Stranraer in Scotland to Nice in the south of France. The final accolade occurred on October 13,1990 when the Way was officially opened by Sir Derek Barber, Chairman of the Countryside Commission. Back in 1982, the route’s steering committee was reformed as the Heart of England Way Association. Today it has two objectives: to maintain the Heart of England Way and the 26-mile Arden Way, which was also devised by the Association, together with the provision of a volunteer-led walks programme. New guides for both routes have recently been written by a member and published. The ways are maintained by a volunteer warden service – the Heart of England Way is split into 24 sections, each with a volunteer warden responsible for general surveillance, way marking and maintenance. The Arden Way is similarly wardened by six volunteers. The association has a walks programme which provides volunteer-led five- or six-mile strolls through the local area on the first Wednesday and third Sunday of each month. For the more ambitious, the association has a long-distance group which tackles long-distance regional routes further afield – this year, the Gritstone Way. Visit http://www.heartofenglandway.org for more information and details of the walk programmes.